Bittersweet Enchantment: Last Days of Freedom Giveaway Hop | Win a ARC of What's Left of Me by Kat Zhang! Last Days of Freedom Giveaway Hop | Win a ARC of What's Left of Me by Kat Zhang! 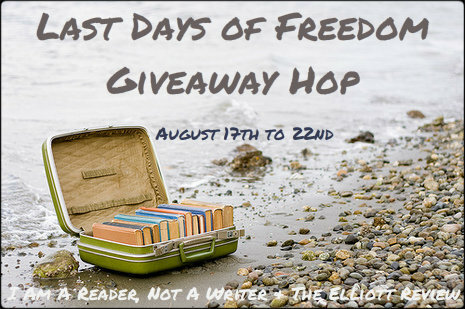 Welcome to the Last Days of Freedom Giveaway Hop hosted by Kathy @ I Am A Reader, Not A Writer. So what you may be asking am I giving away? Good question....are you all ready for this? An ARC of What's Left of Me by Kat Zhang! Yeah, I know. Very cool! I happen to be given a extra copy for a giveaway for my blog. Thank you very much HarperCollins! Please do not cheat. I will check all entries. You may do any or all bonus entries. Good luck everyone! YOU GUYS ROCK! I am addicted to her books! I've been looking forward to What's Left of Me!!! Hmm best summer read so far? Probably Sweet Evil by Wendy Higgins!! So many good ones this summer! I really enjoyed My life next door. I read a lot of great books this summer. I especially enjoyed Blood Red Road. I have a hard time picking a favorite but one of the standouts was My Life Next Door. My favorite read so far was Tiger Lily by Jodi Lynn Anderson. Thanks! Dont breathe a word by Holly Capula! SO GOOD! Thank u for the chance to win! My favorite book so far was The First Husband by laura dave. :) cool blog! What an awesome giveaway. I haven't read this book. The best book I read all summer was Wonder by RJ Palacio. My favorite was Throne of Glass by Sarah J. Maas. It was amazing! The Ghost and the Goth by Stacey Kade!! The Shiver series and the Gemma Doyle trilogy. My favorite was, Delerium, by lauren Oliver. My fave book I read this summer would have to be Hemlock! Thanks for the great giveaway! The best of the summer for me was Easy by Tammara Webber! Giving It Up by Amber Lin. Thx for giveaway. I've read so many great books this summer but one I enjoyed and keep thinking about is The Twelfth Child by Bette Lee Crosby. I recently finished Hush, Hush and Crescendo by Becca Fitzpatrick and I LOVED them! After Hello by Lisa Mangum (I got an ARC, the book doesn't come out until next month) and Everneath by Brodi Ashton! So far my favorite read is Pandemonium. Mine would have to be Ruby Red by Kerstin Gier. The most recent amazing book I read was Let the Sky Fall by Shannon Messenger! AMAZING FOR REAL! I have had quite a few favorites this year. It has been a great year for awesome YA reads. I will name 3 fave's to keep it simple. These I have finished up in the last couple of weeks. Thanks for the chance to win. Muuah! Favorite read this summer was Fated by Rebecca Zanetti. Thanks for joining the giveaway hop!! The Forsaken, it was awesome!! Thanks for the awesome giveaway - I can't wait to read this!! I just finished Ten by Gretchen McNeil - it was really good! I cannot possibly choose just ONE as my favorite so i must mention a few of the ones that I loved: The Syrenka Series by Amber Garr, Everblue and Evergreen by Brenda Pandos, and The Lux Series by Jennifer L. Armentrout. A few other titles to check out are Of Poseidon, Under the Never Sky, The Mindjackers Triliogy, and The Mindreaders series. I loved Daughter of Smoke and Bone. It was great! I loved Onyx by Jennifer L. Armentrout.